There is a certain nostalgia for a read mercury column barometer for me. In the 60s when I was finally moved from a one room school situation to a 'modern' integrated system, a couple of the upper grade classrooms and the high school science room had mercury column barometers in them, so three or four in the same school buildings. One was the more 'modern' type seen in the science supply catalogs, all metal and spiffy. The others were ancient, wood backing in the dark stained motif that seems a recent rather than 50 year old memory. It was there that I learned the function of a vernier that could magnify the accuracy of the readings, and also the interactions with temperature and pressures. 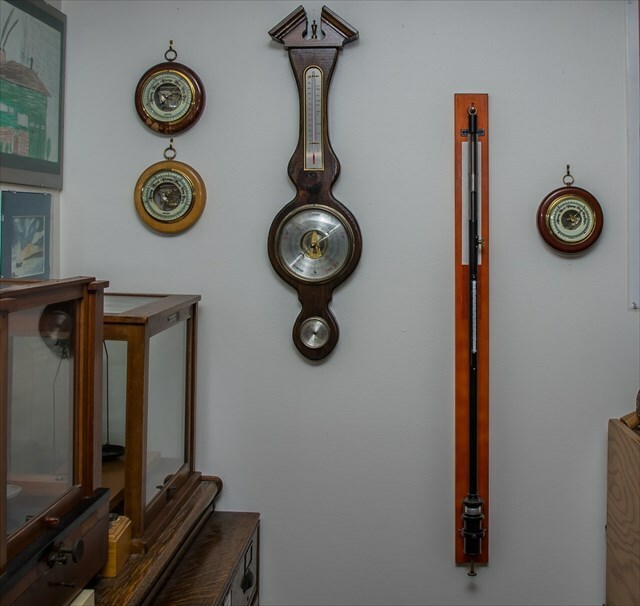 A few years ago I got a new, never used, Welch-Allyn, I believe but I'd have to go look at the box, mercury column barometer from an eBay seller across the state, and picked it up. The seller thought he had a jar of mercury to fill it but never found it, or his wife had taken it to hazardous waste disposal during clean-up week. I'm sure it set the team there in a twitter if indeed that is where it went. This stuff is treated more like highly radioactive material than 'just' mercury, and I know all about mad-hatters and the potential for pollution with fluorescent tubes and broken thermometers. But I'm thinking that the amount of surface area for a mercury pool is small, and for centuries was the standard in weather observation stations, on board ships and as mentioned almost ubiquitous in schools. I recall also doing the penny coating with liquid mercury and having it around the science lab. Never had I been around where it was heated or boiled, so that part is good. What do the folks here think of the risk of installing the barometer, and having it filled and operating? I made one for my home when I was doing some glass blowing in high school, and had it set up with the reservoir being a 20 ml beaker that the end dipped into. I never had a fancy back stick and vernier to do readings, just eyeballed it against a high quality meter stick in the back. Is the risk so great that I'm not appreciating it, and should stay far away, recalling how neat it was rather than setting it up again? If I did want to set this up, I assume a well ventilated area rather than a basement corner would be best. Finally is there a source for the 3-5 # of mercury I think I'd need to fill it and have some in the reservoir? I know it would be like gold or worse to buy, and haven't looked into any local restrictions on having the stuff. I haven't seen one of those science supply catalogs in decades, so I don't know if they still exist or not, but assume that schools must buy their stuff somewhere, and they might be a source for mercury too as they were in the past. Just thinking about it for a project for this winter and whether or not I'll go ahead isn't something I've decided on for sure and looking for thoughts from others interested in weather observation and historic type instruments. I'm not even going to think about how to 'automate' the readings from the barometer to have posted minute by minute on my website. Just joshing. 2009-we were moving out of my last school and found a bottle of Hg about 500 ml. Gave it to the janitors. No idea what happened to it. Schools have had dogs come in and sniff it out. A few years ago, a different district had a teacher break a mercury thermometer. Closed the school for a few days. Talk about over reaction. Raid some old household thermostats????? A few years ago, a different district had a teacher break a mercury thermometer. Closed the school for a few days. Talk about over reaction. ^^ Is that what made you type a block of text with no punctuation? Cuz most, if not all of us over a certain age in the US played with it in school, rolling the little balls around in our bare hands. We mostly all came out more or less normal. like everyone we were all young once without a care in the world ,steady hands,good eyesight ,good balance ,quick reactions ..like it or not mercury liquid form is hazardous ..no offence meant using the word old but if i still had body of my youth ill probably still have a teenage attitude to life and try anything once a bit lime sticking your finger on a live electric cable to see if its live and oh crap thats a lot of current wont do that again ..merely saying beaware the choice to do it is your own..ps a bit like asbestos commonly used for years until someone dug deeper and didnt like what they found but money talks so it still prevails.. Here is an interesting site that I found just now: http://www.charlesedwin.com/mercury.htm on mercury barometers. I too suspect that this is your typical "zero risk mentality" over-reaction towards mercury, but the barometers did hold a lot compared to a thermometer. You piqued my interest in this subject. While looking for a replacement barometer for my Dad (his old banjo style "weather station" seems to have gone bad) I came across this Eco-Celli one. That's an instrument I've never seen. I was looking for another Taylor Max Min thermometer that has a mercury U tube and a magnet to pull the little indicators back down to the top of the columns. I had one as a kid, found another on line, and a garage door swung against the plastic mount and broke it. In any event, they are hard to find, and at one time three or four were on eBay simultaneously. Oh well. But there are plenty of the alcohol max min, so I guess I'll have to make do with a blue and red one. Thanks for the link, I'll go read about them. I still have the high school barometer in my basement, horizontal, and not enough money to buy mercury to fill it. PS I think the little thing to measure down to 0.01" was called a vernier, and was a very neat thing on the one we had on the barometers in various schools that I attended as a kid. I was amazed how something that was machined could slide so easily and with the feel of great quality, and also 'magnify' a reading to make it more accurate. Heh. I was a wastewater plant operator many years ago. The trickling filters (long metal arms on a ball bearing turntable that distributed the wastewater over a bed of large gravel) used mercury for the seals. We needed some. I looked up the spot price of a flask of mercury in the paper. A flask is made of steel with a steel screw stopper, and contains 76 lbs of mercury. I called up a local stock and commodities broker and told him I wanted to invest in mercury. He got all excited, looked up the price, and told me, and wanted to know when I could bring him a check. Then I asked about when and where I could pick up the mercury. "Hey, if I buy gold or silver, I can take delivery of the coins or bullion. I want the mercury." To make a long story shorter, he couldn't grasp what I wanted, that I wanted to hold my investment myself. He said that it wasn't possible. In the end, we bought a flask from an old local miner. The mountains northwest of here have deposits of cinnabar and the miner still had a flask in his garage, next to a box of sweaty dynamite. When we serviced the filters, we would have to clean the mercury by washing it with an acid or something and then rinsing with water and squeezing it through a wet chamois. I know exactly the kind you are referring to. My first serious weather instrument was a Taylor like the one you describe. Bought it after seeing it advertised in Weather Wise magazine. Cost like 12 dollars (memory?) and I had to save to get it. Wife bought me a replacement one about 20 years ago and I still have it.